OK, tomorrow morning I load up the car once again and head out to Park City, Utah for the greatest snow on earth. I'm hoping for decent weather to hold out at least until the afternoon. This is what all of my stuff looks like assembled on the floor ready to be loaded into the Green Machine. This last week in Boulder was good. On Tuesday I heard CU piano faculty David Korrevar play Beethoven's C Minor Piano Sonata and the Bach Goldberg Variations. The seating in the theater was packed and they had to set up about thirty chairs on stage to accommodate the rest of the audience. It was a nice concert overall, and I haven't been to hear classical music in a good long while, so I really enjoyed it. If all the logistics and weather work out tomorrow, my new landlord and I will go hear the Symphony in Salt Lake City tomorrow evening. Thursday I again joined my family on their weekly outing to the restaurant "Med", which was quite good. Then I went to the rock gym one last time. I was only able to use eight of the the ten sessions on my ten-pass, but I think it is still a good deal. Tonight I went to Bill's house for one last home-cooked meal. I played the remaining movements of the Bach Cello Suite Number One (having played the first two New Years Eve). 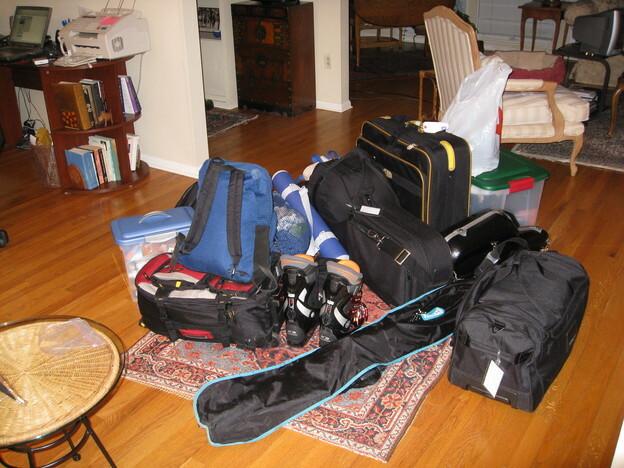 Now I'm packed up and ready to go. Boulder has been really fun, but I'm looking forward to Park City. However, before I officially start Park City I have a week in Sunnyvale next week, which will be a nice break from the cold.